Most of the literature on technology transfers (TTs) has tended to focus on a country or regional level without looking at the cross-continent flows of knowledge that are becoming ever more important due to regional trading blocs. 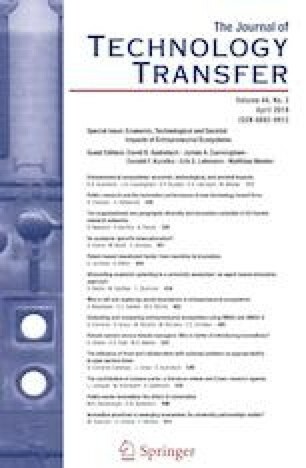 This study fills the gap on the role of cross-continent TTs and institutional factors by focusing on the impact of environment related patents on economic growth. The continents selected for comparison are Europe and Oceania, which differ in terms of economic climate, geography and sustainability policies. In this way, we contribute to the literature on cross-continent TT policies by examining how environmental patents influence the economic growth rate of continents. This will help provide government policy with better means of enhancing TT. We conclude with the implications for managers, theory and policy in conjunction with the limitations and suggestions for future research. The authors would like to thank to NECE-Research Unit in Business Sciences funded by the Multiannual Funding Programme of R&D Centres of FCT-Fundação para a Ciência e a Tecnologia, under the Project UID/GES/04630/2019. Australian Government. (2015). Setting Australia’s post-2020 target for greenhouse gas emissions. Issue paper, March 2015. https://www.dpmc.gov.au/sites/default/files/publications/Issues_Paper_greenhouse_gas_1.pdf. Accessed 12 Nov 2018. GGDC. (2009). The conference board total economy database, Groningen growth and development centre. http://www.conference-board.org/economics. Accessed 12 Nov 2018.